11-09-2014 : TRB may remove the age limit in the Tamilnadu Government Engineering Colleges Assistant Professors Recruitment 2014. The official announcement from the TRB is expected soon. 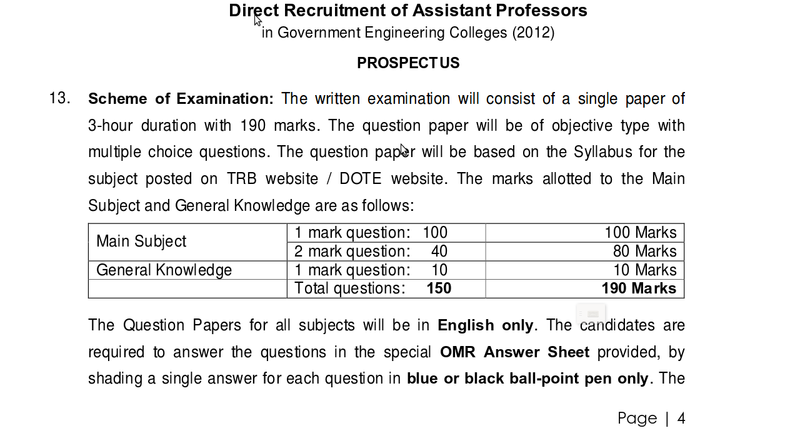 17-08-2014 : The Application forms for the TRB Assistant Professors in Government Engineering Colleges Recruitment 2014 will be issued from 20-08-2014. Where to get ? The candidates can receive the application forms from the respective CEO Offices. 18-07-2014 : The most expected TRB Government Engineering Colleges Recruitment Notification has been announced by the Teachers Recruitment Board Today ( TRB ) ( 16-07-2014 ). Candidates should not be over 35years of age, as on 1.7.2014 for Engineering Subjects and Non-engineering Subjects. TRB has not given any details about Scheme of the Examination in this year notification in the Internet Advertisement in their site.When You purchase application for the exam, you may get all the details with prospects . So I have given the scheme of examination given in the 2012 Notification for Engineering college Asst. professors. The syllabus may or may not change. TRB may give the syllabus details with the Application Form . But for previous year notification, it has informed that the candidates can get the Syllabus for respective subjects in the TRB or DOTE websites.